I love my OCs!! the biggest reason I want to make games is absolutely to share them and their worlds with other people. I'd really like to get a concrete plot down!it's something I've always really struggled with, oops. aIso, I'd like to do some character portraits for RPGMaker since it isn't something I've done before and just generally get more used to the engine. just go for it!! do that thing!! and if you don't have it polished or finished enough for your liking, don't worry about it, because you can always come back to it later! I'm so very ready for this, great concept and I'm looking forward to see the end result! I really have zero experience with anything but twine and I'm making a VN! It's about college-age cultists who do college-age cultist things. I don't think I'll finish it entirely during the jam as, but I hope to at least have a demo by the deadline! 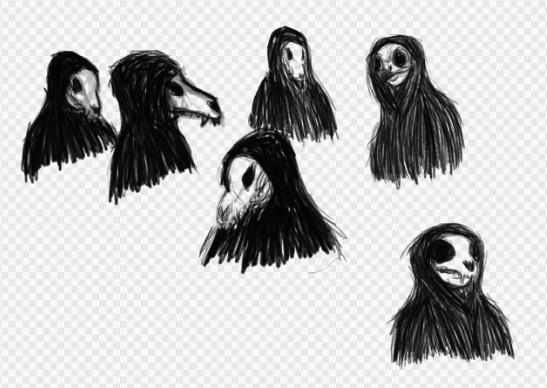 I'm starting on day 2 I guess (whoops) and only have some character design sketches here: (look at those skull cultists). I'm working on assets first and foremost, so hopefully it won't take too long!